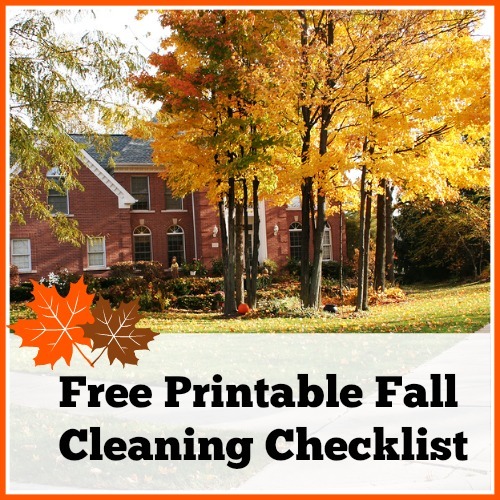 Free Printable Cleaning Schedule for Fall. Fall cleaning checklist? I know everyone is always talking about spring cleaning. But since I’m a gardener I’ve always been more partial to fall cleaning than spring cleaning. Since in spring I’m usually busy getting my garden ready! Plus I like knowing that I’m going into the holidays with my home clean, tidy, and ready for guests. 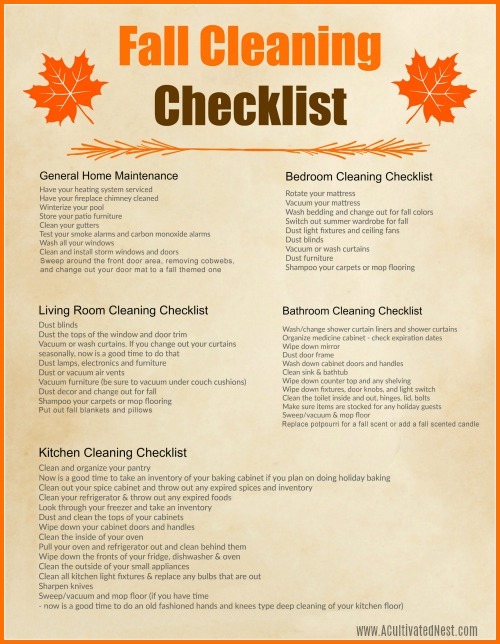 So before you start putting out your fall decor and getting your home nice and cozy for the cooler weather ahead, give your home a deep clean with this Fall Cleaning Checklist! A printable version is available for your convenience at the end of this post. Don’t try to do everything on the checklist in a day or two. Give yourself some time and break down the cleaning schedule into zones or just try to do one or two tasks a day. Don’t forget to get the family involved – everyone can help with autumn cleaning of the house! Are you wondering if now is the time to start fall cleaning, or if you’re too early or too late? It’s actually easy to figure out when fall technically is, as it’s the time between the fall equinox and winter solstice. But based on where you live, that timeline could actually be too late in the year or too long (in the northern hemisphere, the fall equinox is usually around September 22nd and the the winter solstice is usually around December 21st). What I usually use as a cut-off date is Thanksgiving, since it’s at the end of November. So for me, from the fall equinox (in September) to Thanksgiving (in November) is fall, and after that until the spring equinox (in March) is winter. That may not be technically correct, but it’s more accurate for cleaning purposes. After Thanksgiving, I move on to my winter cleaning checklist. Want to easily keep your home clean year-round? 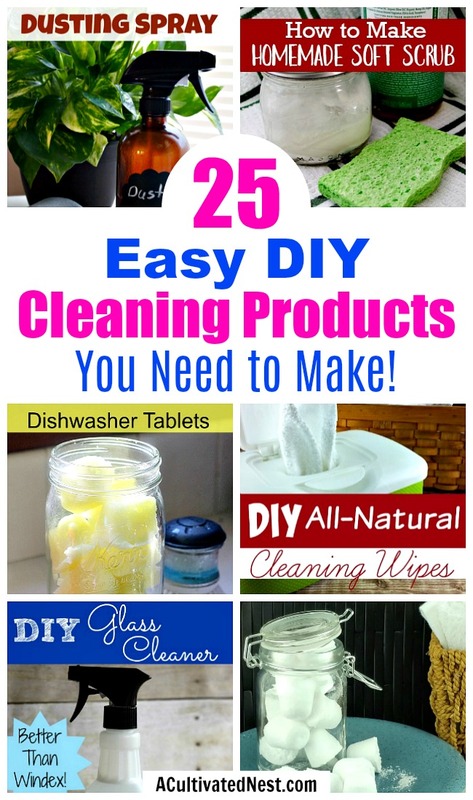 Then you need our printable Cleaning Binder! 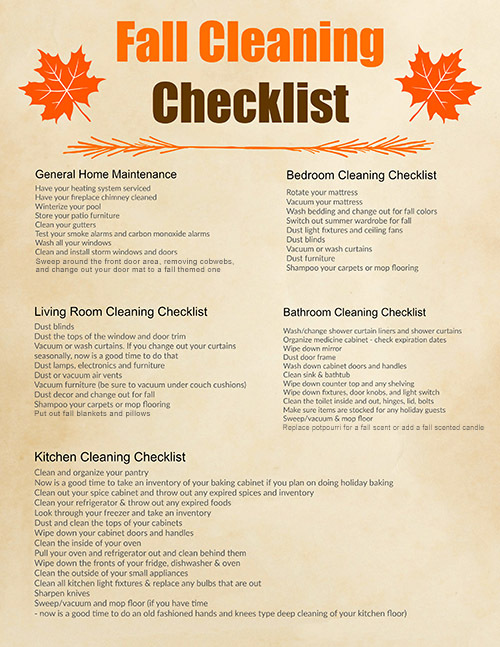 Hopefully our printable fall house cleaning checklist will help you be prepared to enjoy the holiday season! Do you usually do a big home cleaning in the fall? This is an amazing Fall Cleaning List. I have never heard of vacuuming your mattress but I am going to be trying it. Thank you for the printable list. Great check list! Our fall cleaning usually consists of deep cleaning the carpets (we have a carpet cleaner do it because they do a much better job than we do) to get rid of all of the dirt from running in and out all summer. We also try on all of the summer clothes and get rid of any that don’t fit before we put them into storage, and then do that same with the winter clothes as we pull them out. We definitely need to do more fall cleaning though and this is a super helpful list! Thanks!